Venture to Bruges, the “Venice of the north,” whenever you choose. An audio guide will take you on a tour through the city center. After leaving our office near the Louvre at 7:15 a.m. aboard an air-conditioned tour bus, you will arrive at 11:00 a.m., just in time to explore part of the city before choosing a restaurant for lunch. Be sure to taste traditional Belgian fare, such as moules-frites, carbonade flamande, Bruges pork fillet, salmon with asparagus, waffles, and other delicacies. Next, continue visiting the city at your own rhythm. Stop to admire Gothic architecture in the historic medieval city center, which is listed as a UNESCO World Heritage Site. Explore picturesque city streets as you listen to audio guide commentary. 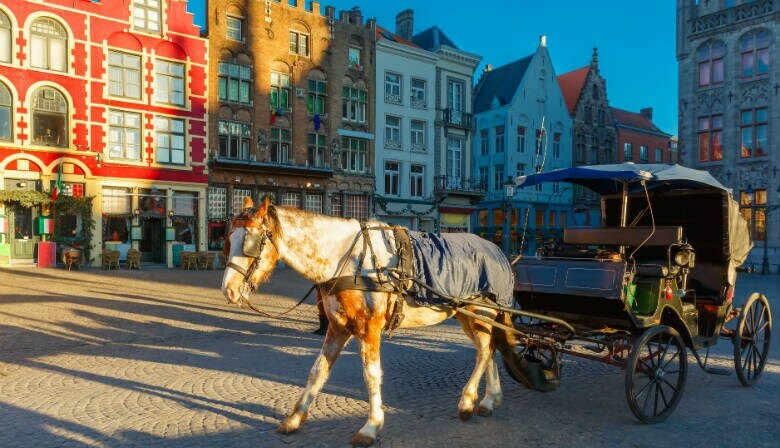 You’ll see Bruges’s most prominent monuments: The Markt, the Belfry of Bruges standing tall in the former market hall, the 13th-century Church of Our Lady and its striking red-brick tower, the Beguinage (a Benedictine monastery) and the impressive City Hall. During your walk, you may want to stop to visit museums that house illustrious Flemish artwork and local artisan craft. Take the time to taste local specialties such as Belgian chocolate. From April to October, you can enjoy an audio-guided cruise down the canals that flow through the city. As you glide through the water, you can gaze out at extravagantly colored Flemish homes and take in Bruges’s quiet, mystical atmosphere. The tour bus will leave Bruges at 4:30 p.m. and will arrive at our agency around 9:00 p.m.
Bruges city center audio guide. I loved it. Maybe 1 hr. more... but overall it was great... our guide was wonderful! On-time, professional, and audioguide so easy! Would highly recommend! Very well organized as far as the emails, the email reminders, the meeting place and time to meet. Once at location, it was very organized and painless to check in. The bus ride was very nice and the 2 guides that accompanied us tourists were also fine. There was a 1/2 way stop at a very nice place to get coffee/breakfast - and enough time to eat prior to getting back in the bus to head to Bruges. The tours were broken up into groups based on what language us tourists preferred. The groups then were sent off for their tour and shopping adventure in Bruges. Our guide was a resident who is obviously very proud of his heritage and town (as he should be). He was very informative, funny, kind, informative, sweet, and informative. (Yes, I said informative 3 times). The meeting time prior to departure was set. Let me tell you, it was not that easy getting out of Bruges. I made it back to the coach just in the nick of time — that was after twice stopping for directions. There was a dinner break on the bus ride back also at a very nice place. BTW, the dinner/breakfast were not included in the tour but I thought that was a nice touch since the meeting time in the morning was 7:15 a.m. and the arrival time back into Paris was 9:00 p.m. All in all, it was a good experience and one that I would recommend to others. I recommend this tour because it was a well-done bus trip. I was not impressed with the staff of ParisCityVision, but as a bus trip, it was good. The highlight was the tour guide they hired for us in Bruges. People who purchased the "Bruges Guided Day Trip from Paris" spent the day with the two guides from ParisCityVision, who (at least on the bus) were a little difficult to understand and who seemed to be concerned with checking off their task list and nothing more. By contrast, when we arrived in Bruges, we were introduced to Patricia: a native of Bruges who spoke flawless English and was wonderfully friendly. She guided us on a meandering tour through Bruges, telling us about a number of charming sites that were not on the audio guide from ParisCityVision. She was wonderful with my 9-year-old son, and the six of us (out of about 50 on the bus) who toured with her were a little sad when she left us at our boat cruise, just because we liked her so much. I think what had happened was that ParisCityVision hired her to walk us to the boat cruise, and she just gave us a more extensive tour because she's a wonderful hostess, but I'm not sure; it wasn't clear from the description that we would have a person like this. Our experience with her was definitely a 5-star (or 6?) opportunity. Because I don't know that every "non guided" group gets to spend time with Patricia, I'd suggest reading about Bruges from a guidebook before you arrive, because the "audiopen" guide they gave us was so laughably awkward to use that it's easier to just leave it on the bus. You do need a good map, though (which ParisCityVision provides with the audiopen), because Bruges is not laid out intuitively, and the important sites are distributed around the town.